As I've gotten older my interest in modern history has developed, and I found a book on the new books shelf at my local library that caught my attention recently. It's titled 15 Stars: Eisenhower, MacArthur, Marshall: Three Generals Who Saved the American Century, by military historian Stanley Weintraub. I had impressions of Eisenhower and MacArthur, and while interested in learning more about them, what most stimulated my curiosity was to read about George C. Marshall, Jr. The only connection I had with his name was its association with the Marshall Plan to help restore Western Europe after WW II. My curiosity increased dramatically when I read in the preface: "The self-effacing Marshall possessed such intense respect worldwide that when he entered Westminster Abbey, unannounced, to take his seat at the coronation of young Elizabeth II, the entire congregation arose." I remember watching that coronation on TV as a kid. (A quick search told me it was in 1953.) I don't recall seeing everyone stand for Marshall, but it probably wouldn't have meant anything to me if I did. So what had this man done to generate such respect? Like MacArthur and Eisenhower, Marshall was a career soldier who served in WW I. When what was to become WW II broke out in Europe in 1939, President Roosevelt appointed Marshall as Army chief of staff, and it was Marshall who would direct the army during the war, with subordinates Eisenhower as supreme commander of the allies in Europe and MacArthur in the Pacific. Marshall always remained above the political fray  I was surprised to read that despite his dedicated service to the country he never voted in his life; Eisenhower similarly had never voted until after WW II, when he began to have his eye on the Presidency  and he had such good relationships with congressmen of both parties that he became Roosevelt's point man in getting congressional appropriations during the war. Likewise, Marshall was admired by Churchill (who called him the organizer of the Allied victory) and was probably the only American military leader respected by Churchill's top military officers. Harry Truman became President when Roosevelt died in 1945 (see the article about Truman's honoring Los Niños Héroes when he paid the first visit to Mexico of an American President two years later) and continued relying on Marshall, who transferred his loyalty seamlessly to the new President. Truman, like Roosevelt during the war years, had poor relationships with Congress and named the economic package to rebuild Europe "The Marshall Plan" in order to capitalize on Marshall's popularity and skill in congressional interaction. After the war Marshall wanted nothing more than to retire to his home in Leesburg, Virginia, where he walked, rode horses, gardened, hunted and fished. 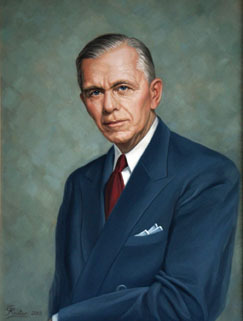 He requested to Truman that Eisenhower succeed his as Army chief of staff, which Eisenhower agreed to reluctantly until Omar Bradley could take over. But shortly before his retirement party the ambassador to China resigned, and Truman asked Marshall to go to China to try to straighten out the situation between Chiang Kai-shek and Mao Tse-tung. He was in China from the end of 1945 until the beginning of 1947, when he returned to be appointed Secretary of State by Truman. During that June he laid out the European Recovery Plan, later to be named the Marshall Plan by Truman, at a Harvard commencement speech. Time magazine named him Man of the Year in 1947  as they had previously in 1943. In 1948 Marshall, then almost 68, collapsed in pain from a too-long delayed need for kidney surgery, by which time the kidney had to be removed. Determined on a private life, he resigned effective January 20, 1949 (inauguration day for Truman's elected term as President). He was succeeded by Dean Acheson, who wrote to Marshall that twice in his life he had been understudy to greatness  as a young man under Justice Oliver Wendell Holmes, Jr., and under Marshall. His retirement was short-lived, however; in October of that year he agreed to take over as president of the American Red Cross, which was in a mess. He had traveled 20,000 miles on Red Cross business by the time the Korean War broke out in June 1950. In August of that year, while on a fishing trip, he got a call at a county store in Michigan  from President Truman. The gathering crowd only heard a laconic, "Yes, Mr. President" several times. Truman asked him to come back to government service as Secretary of Defense. He served in that post until finally retiring in September 1951. 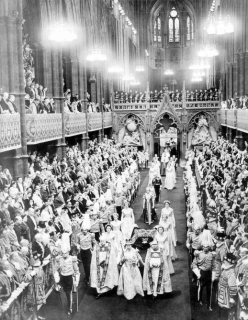 In Westminster Abbey, as Marshall walked toward his seat near the altar, he noticed that the throng of nobility, heads of state, and other eminent invitees was rising to its feet. "Who are they rising for?" he whispered. "You," said Bradley. Later that year Marshall was awarded the Nobel Peace Prize  the only professional soldier ever to receive the award. Churchill referred to him as "the last great American." Truman called him a "tower of strength and common sense." More recently Colin Powell named him "one of the greatest Americans who ever lived." When Truman heard of Marshall's death on October 16, 1959, he said: "He was the greatest of the great in my time. I sincerely hope that when it comes my time to cross the great river, Marshall will place me on his staff, so that I may try to do for him what he did for me."